TDAppTools is available for all TD versions, starting from TD 2.1 up to TD 7.0.
the application internals is highly needed. is going on in the application can be put to use to quickly spot errors or detect faulty data. Placing messageboxes temporarily can show internal control data at specific points when executing a workflow. Testers could need ways to extract data which is populated in GUI objects to validate if the data is correct. which are not clearly visible for the end-user. Service engineers who are on site at a production environment could encounter issues which should be reported back. can work more efficiently to find and eventually fix defects. To enable this, the developer has to add custom code to access these internals throughout the code. And every project needs it, some way or the other. to fit into those projects. This gave me the idea to implement a ready-to-go toolset which can easily be added to any application. and could potentially interfere with existing code and have an effect on the inner workings of applications. So, TDAppTools add-on is meant to be packaged features in physical separated files which would not harm existing code. The only elements added to project source-code is calling the needed interface of the add-on to start specific features. As TDAppTools is a personal project and mainly developed in spare free time it is not feasible to introduce all wanted tools at the start. The first tool in TDAppTools v1.0 will be the Gui Inspector, which is a very valuable addition to any project. The second mayor release, TDAppTools v2.0 contains Sql Monitor, a tool to inspect Sql actions performed by your application in real-time. Later on, other features will be added in subsequent versions. - New: TD Themes selector. Change TD theme on the fly. This tool is Spy++ with a TD flavor. 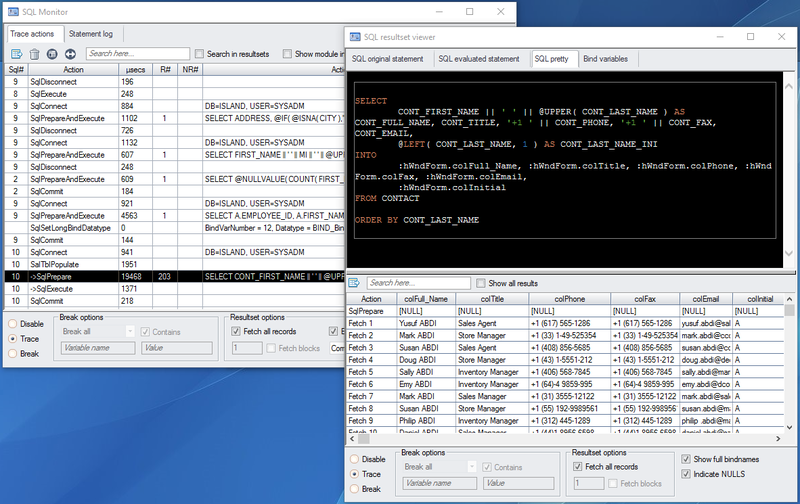 It is used like other GUI spy tools, but the Gui Inspector has the advantage that it shows specific TD information other generic spy tools do not offer. With the well known object selection tool, Gui objects can easily be identified on screen. 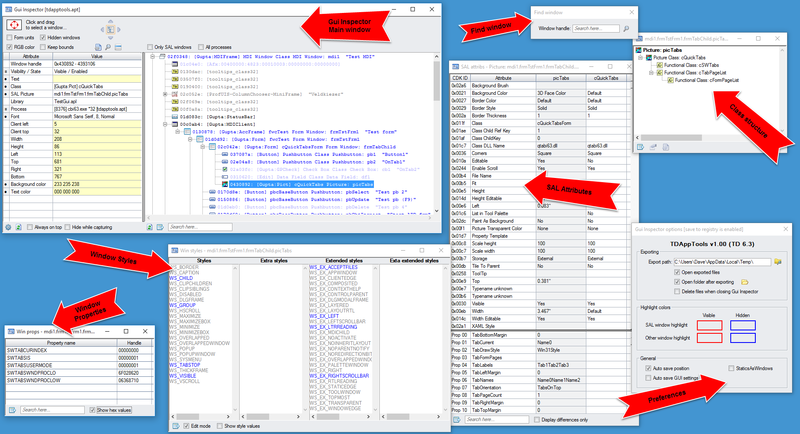 All information of the object is fetched in real-time and shows SAL details which will benefit anyone wanting to get more detailed information of the Gui internals. Instead of creating a complete manual of Gui Inspector, demo videos have been created to demonstrate the features and how to integrate it in your own projects. You can find the DONATE button here on the TDWiki in the toolbar at the left. Shows the actual time spend to execute the actions (measured on API level, so no extra noice of business logic etc). v2.1: Break in source, to break at the source code line where SQL action is executed. This page was last modified on 9 January 2019, at 13:52.